In order to create the staggered effect with the quilt blocks in Shadow Boxes, you need to not only create the full quilt blocks but also the block X half quilt blocks. Jenny shows what the blocks would look like in more boyish primary colors as well as the full quilt. 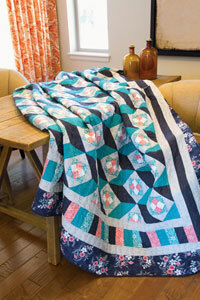 She gives tips and tricks for the bias edges and how to join the first border to the blocks.